Following stories in the press that new Rangers manager Steven Gerrard was set to give forgotten striker Joe Dodoo a second chance at Ibrox, news has broken this hour that he will be going out on loan to Blackpool. In short, no, he was not getting a second chance at Ibrox, and wherever that story came from (not our sources anyway) was completely and total shash. Rangers continue to look for striking talent, and attacking flair, with only two recognised strikers on the books – Alfredo Morelos and Eduardo Herrera. Everyone else is either expired or otherwise departed meaning the opportunity was definitely there for Dodoo to make a mark on the team, and information claimed that’s exactly what Stevie Ger was going to do. But now we know he is close to departing for Blackpool in League One pouring cold water of any opportunity under Gerrard, showing the information claiming he was getting that chance was absolutely wrong. 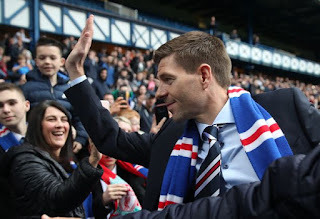 We are a little disappointed he won’t be getting a shot at the first team this season, but in Gerrard we trust and hopefully the new players coming in will be befitting of Rangers. What a non story .... no one thought he was getting a chance in the first team . We cant sell him so best we get his wages off the payroll. Like any player at a football club they are a commodity. Even if Stevie Gers did state that he was part of his plans it’s the sensible thing to say. Not every football player develops at the same rate so sensible to retain and loan out. Why dump him when he may develop into a quality player. Not saying he will but it’s a sensible approach. I have to agree that he wasn't given a real chance. He was often stuck on the wing and came in and out the team. I also agree we set the bar high but we need depth in the squad and If were signing junior players like ejaria we should be looking at developing these players instead. We cant sign a few decent players and hope nobody gets injured. 3-2 OF game springs to mind and bringing in cardoso PMSL...I expect a lot of activity because the squad is thin up front and at the back. Keep in mind the atmosphere should be different and playing in a positive environment could make all the difference for a few players that lack confidence. Morelos for 1. Disappointed for Dodoo.... I think he has it in him to be a great player and don’t believe he was given a fair crack of the whip. The boy was never given a fair cracking at the whip. He was never brought in to be #1 striker so criticism of him is grossly unfair. The boy needs to be playing regularly and if it's with blackpool so be it let him go and get his confidence back. He's a dud. Have to agree. We need to get RID of all the dead wood. Offload. Get cash and buy more sensibly. You people piss me off, do you think players come to this club with the intension of playing badly. They come with dreams of becoming Rangers players and doing the best the can . They are not pish or chancers or duds , they are young men with hopes and dreams and if things don't work out then they should thanked for the effort and be allowed to move on without being maligned by people who probably never kicked a ball in ernest .